We crave enchantment. We need to be seduced by myth and magic and fairies and castles and druids. The reason is that some part of us longs to penetrate through that “mythic mist” and break through the barriers of the ordinary, five-sensory world in order to make contact with organic Divinity, manifested in earth magic, stone circles, and fairy rings. Ireland’s St. Bridget came from a Druid background. Legend has it that she was trained in Druid rituals of healing and organic mysticism, and then drawn to the convent where her earthly mystical roots grew into a cosmic mystical connection with the Divine. I’ll do a Druid article at another time. Now I’ll admit to a little ‘flack’ from a few people, not many, though I’m glad to say on the ‘layout / content’ of my blog, and with the amount of views of my website / blog, I don’t think that a mere ‘couple’ of naysayers are going to bother me very much. Suffice to say I do cover various topics that I find of interest, with the Internet being as vast as it is, information overload etc… I spend a great deal of time ‘filtering through’ the information and presenting it *with relevant links to the author, what I found to be both, the most informative and interesting information.. The following From “Timeless Myths” (except pictures) : “Fairy” comes from the Old French word faerie. The word has been overused to describe a supernatural being. There is a great deal of difference in classifying a being as a fairy from the medieval literature and those from modern literature, especially those belonging to the Celtic tradition.There are other traditions such as that found in English, German and Slavic folklores. 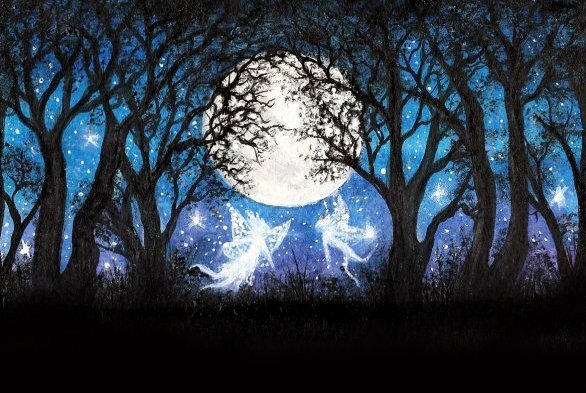 Today, when we think of fairies, we often visualise them as tiny, supernatural beings with wings and glowing with uncommon light in today’s children fairy tales. And they also possessed some sorts of strange magical powers, like Tinklebell in the story of Peter Pan or the Fairy Godmother in Cinderella. The modern fairies, between the 18th and 20th century, comes from oral tradition before they were transmitted into writing. The fairies are supernatural beings that can be best described by the Greek word – daimon, which means “spirit”. They are not divinity, ie. god or goddess, in the usual sense of the word, and yet they are not mere mortal; often, it is easier to classify them as minor divinity. A portrait of a fairy, by Sophie Anderson (1869). The title of the painting is Take the Fair Face of Woman, and Gently Suspending, With Butterflies, Flowers, and Jewels Attending, Thus Your Fairy is Made of Most Beautiful Things – purportedly from a poem by Charles Ede. It was during the time of Queen Elizabeth I of England, where William Shakespeare (1564-1616) had popularised fairies in English folklore, in his play Midsummer Night’s Dream, with the characters Oberon, Titania and Puck (Robin Goodfellow). Earlier than Shakespeare, Chaucer (1342-1400) mentioned that the land of Britain was filled with fairies before the time of King Arthur. In the Arthurian legends, the divine or fairy figures also appeared in abundance. Morgan, Arthur’s half-sister, seemed to be a great sorceress and healer, was often called Morgan le Fay; her nickname Fay, which means “Fairy”. And then there is this Lady of the Lake. Arthur’s wife, Guinevere, or Gwenhwyfar in the Welsh tradition, also appeared to be a fairy, as well as the sovereignty goddess. Many knights were either born from fairies or they took female fairies as their lovers. Even Merlin was only part mortal. Then you would discover that that these images of fairies are not the only kind. There were all sorts in fairy tales and folklores. Some are benign, while others are maligned and hostile to mortals. Some were seen as fair, while others were considered ugly and monstrous to look at. They can come in all size and sizes – tall or short, fat or skinny, so there is really no clear definition of fairies may look like. Different types of fairies may also have different types of magical powers. These earlier Celtic traditions of fairies, the former Irish or Welsh deities were also not fairies in the usual sense. They looked very much like human, in size and shape, except that they have special magical powers and they seemed eternally young, but they don’t have wings. The Dananns or their Welsh counterparts were usually seen as race of fair people. They can die just as mortals can, but their lives could last hundreds or even thousands of years. Most of the information about Irish fairies here, comes from 19th century poet, Williams Butler Yeats. In 1846, William John Thomas, who contributed the term folklore to the English language, commented in The Athenaeum that “belief in fairies is by no means extinct in England” (Merton, p. 1846, 55). Thorns was not alone in his opinion; he was merely echoing and endorsing the words of others such as Thomas Keightley, the author of The Fairy Mythology. For believers were not limited to gypsies, fisherfolk, rural cottagers, country parsons, and Irish mystics. Antiquarians of the romantic era had begun the quest for fairies, and throughout Victoria’s reign advocates of fairy existence and investigators of elfin origins included numerous scientists, social scientists, historians, theologians, artists, and writers. By the 1880s such leading folklorists as Sabine Baring-Gould, Andrew Lang, Joseph Jacobs, and Sir John Rhys were examining oral testimony on the nature and the customs of the “little folk” and the historical and archaeological remains left by them. At the beginning of the twentieth century, eminent authors, among them Sir Arthur Conan Doyle and Arthur Machen, swelled the ranks of those who held the fairy faith and publicized their findings. In a remarkable “trickle up” of folk belief, a surprisingly large number of educated Victorians and Edwardians speculated at length on whether fairies did exist or had at least once existed. For the Irish, especially those involved in the Celtic revival, belief in fairies was almost a political and cultural necessity. Thus, William Butler Yeats reported endlessly on his interactions with the sidhe (Irish fairies) and wrote repeatedly of their nature and behavior. His colleagues AE (George Russell) and William Sharp/Fiona Macleod proudly enumerated their fairy hunts and sightings, and the great Irish Victorian folklorists–Patrick Kennedy, Lady Wilde, and Lady Gregory–overtly or covertly acknowledged their beliefs. Even those not totally or personally convinced, like Douglas Hyde, remarked that the fairy faith was alive and well in Ireland. A VERY WELL-DONE INTRODUCTION TO FAIRIES, ET AL…!! !